So the rumors begin again thanks to that bastion of truth, justice and the American way, the Wall Street Journal. Verizon and iPhone...coming this January. It got me all excited and then I said "self, relax, the promised it in 2008, they promised it in 2009, they talked of it in 2010...the exclusivity contract with AT&T is one of the most closely guarded secrets, right up there with the recipe for Thomas' English Muffins (only 7 executives know the entire formula including how much dough to use, the right amount of moisture and the proper way to bake them...so who the heck-a-doodle knows when those of us who refuse to go to AT&T will have the chance to buy the iPhone. I do like my Blackberry and there are some cool apps for it and all, but without an iPhone I am told I can't hang with the cool as the nooks and crannies kids! I enjoyed watching some of the Q&A with Supreme Court Nominee Elena Kagan. The woman is sharp as a tack and has one hell of a great sense of humor. KAGAN: You know, like all Jews, I was probably at a Chinese restaurant. You HAVE to love her! I almost rolled off the couch when I heard that! Maybe the comment was not understood by much of the country, but in NY pretty much the only place you can go to dinner on Christmas Day is a Chinese Restaurant. So if you are Jewish, you have two choices, Chinese food or a movie...or both! The Pyramid, the sports complex used by the Memphis Grizzlies and the Memphis Tigers basketball teams prior to their bolting to the FedEx Forum here in Memphis has sat empty for some 6 years. It now looks like it will finally join the living as the city of Memphis and Bass Pro Shops have finalized their negotiations to allow Bass Pro to lease the building with a 50-year contract. The company is going to put in a store and an aquarium and the area around the Pyramid will be revitalized by the city using all of their $41.5 million in federal recovery zone facility bonds for to do a seismic retrofit of the building and also for public improvements around The Pyramid. The amount is the city’s entire allocation of the bonds. The money is basically a federal subsidy of the interest on the bonds, which will be issued by the city. A planned hotel inside the structure has been abandoned because the cost of the seismic retrofit would have ballooned to a cost not affordable by the parties. Here is the thing. We have Beale Street. That is where so many tourists go. Also, there is Main Street, a great street that traverses the length of the city. There are storefronts and great places for restaurants and the Trolley runs the length of the street. The street is trying to make a comeback, but is pretty empty right now. Apartments and condos are being built on the upper floors of the building...not sure how they are selling. 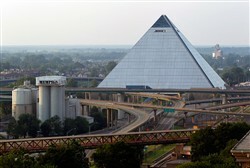 The Pyramid is on the opposite side of the city from Beale Street and the Gibson Museum and FedEx Forum. Already the city can not attract businesses just off Beale and now they are going to try and revitalize the opposite side of town, where - as far as I can tell - very few people ever venture. It will be interesting to see how this all flushes out. PHFRANKIE: No you can't...but what about a Sphinx? Yup-we like here here in Boston..but then again...that should be kind of obvious! I heard the chinese food comment on NPR the other day-FUNNY! Three cheers for Supreme Court Nominee Elena Kagan! If these guys would just give up and allow the supreme court be all women half the cases that are paraded before the supreme court now would not have to be there. Just my opinion though. That won't be good, it will all end up in the Gulf and make an even bigger mess. I think there might be a better use of 41 million dollars than that. Nice to know that Memphis has no crime, poverty or public school problems if that's all they can think of to use the money on. I know a lot of people who refuse to get an iPhone as long as they have that exclusive deal with AT&T. Also, I think keeping that exclusive deal with AT&T is a big F-YOU to Apple customers. iPhone *shrugs* I just don't get all of the hype! You can hang with me and my Blackberry. We'll start our own cool kids club where we eat sourdough toast instead of nook-and-cranny muffins.